The HTC Hermes/TyTN (Cingular 8525) can already be used on Cingular UMTS/HSDPA. 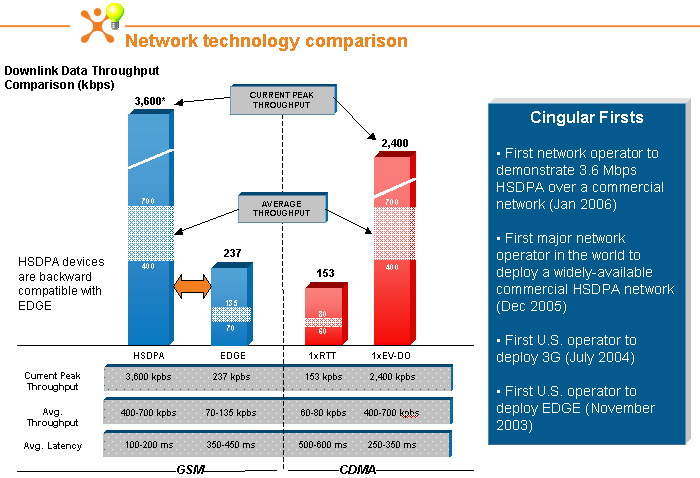 UMTS/HSDPA is indeed a CDMA technology, but one meant to be built onto GSM networks. Really? EVDO is not 3G? I think many people, and web sites, would differ with your opinion..
EVDO may have 3g speeds (or close to), but that does not make it a 3g device. CDMA 1XEVDO is in fact a third generation wireless technology, whether you believe it or not. So that I have my facts correct...let me summarize and pls correct me if I am wrong. See graph below. It's taken from a Cingular presentation. This is for U.S. based carriers. - EVDO Rev. A is coming out from Sprint and promises faster speed than Rev. 0 but however won't support true voice AND data transfer simultaneously with playing around with VOiP technology. It's a CMDA technology. The speed is up to 2.4 mbps and latency is 250-350 ms. I don't believe that diagram is comparing to Rev. A. The Cingular folks told me it is a comparison with Rev A. If you meant to post "without VoIP" you'd be right. EVDO Rev. A supports voice using VoIP because that network is how the new Sprint 2-way network, utilizing QChat, will operate. I have read through this post and i am a "first time" Blackberry Forum virgin. I really love my BB and have the 7290 - i am not a fan of the 8700 although everyone i know has it. I do however, love the new 8707v and i see you guys were discussing. In Dummy Proof terms for me, would this 3G technology work if i purchase the 8707v say on ebay or overseas and brought it here - and connected with Cingular? According to the agent i spoke to over the phone, she said YES it would - BUT the only thing is if it breaks, i am on my own ( that's fine ) what else is new...but other than that, it would work. 1 - is it worth the buy? 2 - is the 8800 a great upgrade? 3 - is there something better to wait for? 4) 8707 only supports GSM/GPRS in North America - while "technology wise" it is the same UMTS technology used here, the frequency band that it operates on (2100) is not used AFAIK by any NA provider. The 8100 is 3G-ready now, but T-Mobile is not. They should be rolling out their 3G network in early 2007, with some testing in limited markets (big cities) starting right about now. I believe Seattle is first up, and hopefully New York is not too far behind. I guess the real question is, would I be able to use an UNLOCKED 8707v on cingular...also, is the 8707v GPS capable, would I loose any functionality with the 8707 vs the 8700c? Just read off the imei they should put it through a key gen an they will red a 10 digigit alpha numeric cod to you write it down. now if you hsd 6+ data channels you would notice it.